Cauliflower rice, essentially just pulverized cauliflower, and tofu are great swaps for making a lighter fried “rice.” This dish is packed with flavor and color; it includes more than your typical fried rice. Nutrient-packed sweet potatoes, purple cabbage, bell peppers, and greens! This looks more like confetti, “fried” rice! Sweet potatoes are a great addition to the meal, providing healthy carbohydrate and fiber. They are also packed with cancer-fighting properties and carotenoids – a class of antioxidant. Sauté the garlic in 1 tablespoon of water until lightly browned. Add in the onion and cook until the onions start to become translucent. Add the sweet potato and additional 1-2 tablespoons of water, as needed to keep the veggies from sticking. Sauté the veggies until the sweet potatoes start to soften. Add the zucchini, peas, peppers, and cabbage to the stir fry. Continue to add a tablespoon of water as needed to keep the veggies from sticking. Stir in the ginger and Braggs/soy sauce. Finally, add in the greens. Allow the greens to simmer down and then remove the veggies from the heat. Using a clean towel, press the water out of the tofu. Sauté the tofu without oil or water on medium-heat. Break the tofu into small pieces and cook until desired texture. Stir in the turmeric and black pepper. Set aside. In a clean pan, lightly toast the cauliflower without oil or water. Avoid over cooking. 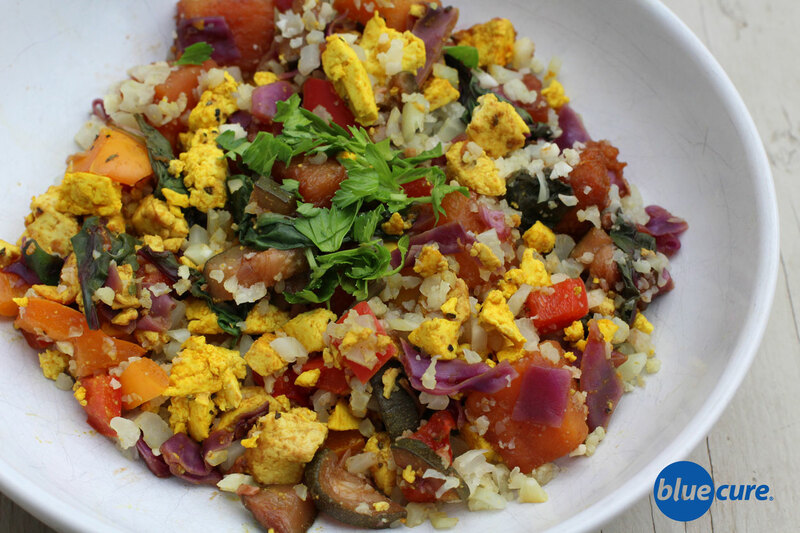 In a bowl or a large pan, combine the cauliflower, tofu, and veggies, Fold until well combines. Serve on 3-4 plates or bowls and top with fresh herbs. Serve with avocado or toasted cashews, if desired. Enjoy!